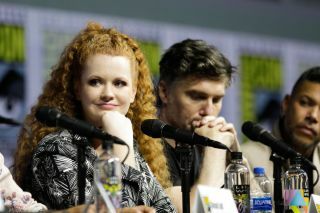 Mary Wiseman and Anson Mount during the "Star Trek: Discovery" panel at San Diego Comic-Con 2018. "Star Trek: Discovery," "The Orville," "Star Wars: The Clone Wars" and many more beloved — and new — sci-fi titles and franchises took center stage at Comic-Con International: San Diego last weekend, unleashing a fountain of new footage and an eruption of announcements for fans. So, just in case you missed something, here's our helpful, all-you-need-to-know guide to the best bits of this year's San Diego Comic-Con (SDCC). "Star Trek: Discovery" went big at this year's Comic-Con, taking over the legendary Hall H and offering a first look at Season 2 and details about "Star Trek: Short Treks." On hand from Discovery were cast members Sonequa Martin-Green, Doug Jones, Shazad Latif, Mary Wiseman, Anthony Rapp, Wilson Cruz, Mary Chieffo and Anson Mount. Fans were treated to a sneak peek at the show's upcoming second season, with footage introduced by series co-creator and executive producer Alex Kurtzman, who directed the Season 2 premiere. You may remember that, back in June, showrunners Gretchen Berg and Aaron Harberts were let go, and Kurtzman was effectively told to take the conn. If you recall, at the end of Season 1, the USS Discovery was last seen in a rendezvous with the USS Enterprise, currently under the command of Capt. Christopher Pike. Apparently, Spock (who, coincidentally, has taken a leave of absence from the Enterprise so we don't get to see him — yet) is connected to a significant new cosmic threat, with strange anomalies popping up throughout Federation space, necessitating an urgent response from the Enterprise and now the Discovery, which Capt. Pike takes command of. What does poor Saru have to do to become captain?! Before Discovery returns for its second season, CBS also revealed that it will release four "Short Treks" minisodes, which will be approximately 10 to 15 minutes long and will cover many of our favorite secondary characters. Rainn Wilson will return to play the mischievous Harry Mudd in a short that he will also direct, and Aldis Hodge will star in another as Craft, a man who finds himself the only human on board a deserted ship. Additional episodes will include a deep dive into Saru's backstory as the first Kelpien to join Starfleet, plus Tilly's journey aboard the USS Discovery and her friendship with an unlikely partner. Intriguing. "There is no shortage of compelling stories to tell in the Star Trek universe that inspire, entertain, and either challenge our preconceived ideas or affirm long-held beliefs, and we are excited to broaden the universe already with 'Short Treks,'" Kurtzman said in a statement. "Each episode will deliver closed-ended stories while revealing clues about what's to come on in future 'Star Trek: Discovery' episodes," he added. "They'll also introduce audiences to new characters who may inhabit the larger world of Star Trek." In addition, a couple of cast announcements were confirmed, including Rebecca Romijn as Number One — a character played by Majel Barrett in the pilot episode ("The Cage") in the original "Star Trek" — and the return of Cruz, who will reprise his role as the Discovery's chief medical officer, Hugh Culber … even though the character was controversially killed off in the first season. The second season will also visit Saru's home world and continue to explore the Klingon storyline established in Season 1 surrounding L'Rell's ascendancy to the position of chancellor on the Klingon home world Qo'noS. There was no mention of Section 31, so we don't know yet if that clandestine arm of Starfleet is involved with the aforementioned cosmic threat, despite the tease of "Section 31 Bridge Blueprints" back in April. A still from the teaser trailer for the surprise seventh season of "Star Wars: The Clone Wars" released at San Diego Comic-Con 2018. During the 10th anniversary celebration panel, it was announced that "Star Wars: The Clone Wars" will return with 12 brand-new episodes on Disney's streaming service, sending fans into a frenzy. Created by George Lucas, the show became the entry point into the "Star Wars" universe for an entire generation, following characters like Anakin Skywalker, Obi-Wan Kenobi and Padmé Amidala, while introducing new ones, like Ahsoka Tano and Captain Rex. It's now regarded as essential "Star Wars" and has even won a number of Emmys. However, "Clone Wars" was never finished; it ended after five seasons — just as Ahsoka was leaving the Jedi Order. Five post-season episodes were later released as "The Lost Missions," but the story wasn't over. Fans have been clamoring for Disney and Lucasfilm to finish what was started — and now, finally, it's happening. A still from the teaser trailer released at San Diego Comic-Con 2018 for "The Orville" Season 2. Oddly enough, the new trailer for Season 2 of "Star Trek: Discovery" seemed to have more humor than the trailer for "The Orville" … but there's no denying that this looks like it's going to be a lot of fun. The show is clearly bigger and better — and has a larger budget — than last year. The series' creator, Seth MacFarlane, has said he wants the show to lean a little less toward comedy and more toward serious sci-fi. But there's no doubt that there will still be the trademark MacFarlane tension-breaking humor, punctuating some otherwise suspenseful scenes. "The Orville" was a big hit for Fox when it debuted last September, and the 12-episode run retained a high viewership. Jon Favreau directed the show's pilot, and through its first season, it attracted some big names and former Trekkies to take the helm, including Brannon Braga (producer on “Star Trek: The Next Generation”), who directed four episodes; Robert Duncan McNeill (Lt Tom Paris in “Star Trek: Voyager”), who directed two; and even Jonathan Frakes (Commander Riker in “Star Trek: The Next Generation” and director of “Star Trek: First Contact” and three episodes of “Star Trek: Discovery”). The show stars MacFarlane, Adrianne Palicki, Penny Johnson Jerald, Scott Grimes, Peter Macon, Halston Sage, J. Lee and Mark Jackson. Season 2 premieres Sunday, Dec. 30 on Fox, which is only a few weeks before Season 2 of "Star Trek: Discovery" will likely air. Next year is already looking good. "Judge Dredd: Mega City One"
A shot from "Judge Dredd." Fans of "2000 AD," the long-running British sci-fi comic book series that gave the world Judge Dredd, were going bananas last week. First, Duncan Jones — writer and director of the epic, indie, sci-fi smash hits "Moon" and "Mute" — announced on Twitter that his next project would be about Rogue Trooper, another fan-favorite "2000 AD" character. The story follows one particular genetically engineered supersoldier, nicknamed Rogue, during a future war on a planet called Nu Earth. It's a gritty, toxic war story that draws inspiration from many real conflicts over the past few centuries. The planet's surface has become so poisoned that soldiers must wear chemical suits to survive — except Rogue, who has been designed to be able to survive in the deadly environment. The special effects required certainly represent a challenge for Jones, but from what we’ve already seen of his work, we're convinced he's the right man for the job. And secondly, Rebellion, the owners of "2000 AD," announced during its panel at SDCC that preparation for the much-anticipated TV series "Judge Dredd: Mega City One" is progressing apace. During the panel, fans learned that the pilot script and plot for the show's first two years have been completed, with Rob Williams, a name familiar to Dredd fans, signed on to the project. Williams, who has written Dredd for many years, is the creative lead for the show. In addition to the pilot, he worked with a group of writers on the plot for the show's first couple of seasons. Despite the title, Dredd himself will not be the sole focus of the show, which will instead be an ensemble drama. And there are so many amazing characters in the expanded Judge Dredd universe that it could explore, including Chopper, Judge Anderson, America and Judge Death, to name just a few. Karl Urban, who starred as Dredd in the 2012 attempt to bring the larger-than-life character to the big screen — written by Alex Garland, known for "Sunshine," "Ex Machina" and "Annihilation" — has already expressed interest in returning to the role, so we'll have to watch this story closely as it develops. The Thirteenth Doctor gets to work in the newest "Doctor Who" series. "Doctor Who" will return later this year with a new Doctor, played by a woman for the very first time. The trailer gives us our first real look at Jodie Whittaker in action as the Thirteenth Doctor as she recruits a few new companions: Yasmin (Mandip Gill), Ryan (Tosin Cole) and Graham (Bradley Walsh). Plus, it teases the new worlds and adventures they'll be embarking on. We also get our tiniest first glimpse at the latest incarnation of the all-important Sonic Screwdriver. During the panel, Whittaker talked about her journey from Cardiff to Gallifrey, Hollywood and beyond. Don't worry if you missed it; the full panel is available on YouTube below. The new season will be a 10-week run of 50-minute episodes on BBC America beginning in the fall, kicking off with a feature-length episode, the panelists said.